Moffat in Southern Scotland, with the River Annan running along the edge, is an attractive town only about a mile off the M74. Moffat was once a small village and coaching stop but during the 17th century Moffat began to grow into a popular spa town. The sulphurous waters of Moffat Spa were believed to have healing properties and during the Victorian age there was so much demand, that it led to the water being piped down from the well to a specially built bath house, now the Town hall, and luxury hotels being built to accommodate the vast amount of visitors to the spa. Robert Burns often visited the strong smelling sulphur waters and also the local bars. The well was refurbished in the 1990’s and is still accessible by vehicle or foot. Moffat was also a market for the wool trade this is commemorated by a statue of a ram by William Brodie which stands in the market place. Today Moffat is a conservation town with modern amenities. There are lots of specialist shops, cafes, hotels, pubs, B&B’s and free parking in the centre. The most outstanding building of the town is the Moffat House Hotel which is a Best Weston. The Star Hotel is recorded in the Guinness Book of Records as the narrowest hotel in the world at just 20ft (6m) wide. Moffat is notable for its flowers and won the “Britain in Bloom” competition in 1996 and is also home to the well known Moffat toffee. The Station Park on the edge of town is a great place to relax or take a game of pitch and putt, or table tennis, or take a ride on one of the swan shaped boats on the boating lake and for the children there is the play ground and Moffatasia. If you are feeling more energetic there are many lovely walks to keep you fit. 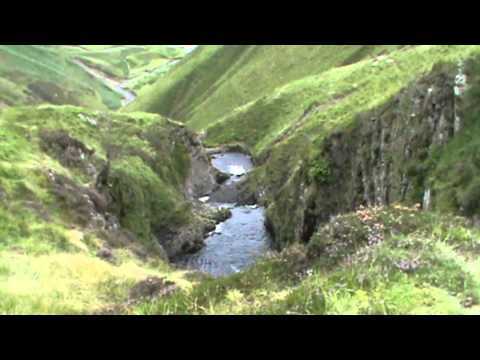 The Grey Mare’s Tail, in the deep U-shaped Moffat Valley, is a 200ft (60m) hanging waterfall and is well worth a visit. The fall is produced by the Tail Burn flowing from Loch Skeen cascading into the Moffat Water in the lower valley below. The surrounding area forms the Grey Mare’s Tail Nature Reserve owned by the National Trust for Scotland and the scenery is wonderful. The short steep climb, up the side of the waterfall, to the picturesque Loch Skeen at the top and for the striking views of White Coomb and the surrounding countryside makes all the effort of the climb worthwhile. There are many rare plants thriving in the rock seams and in patches of lime-stone rich soil and every year peregrine falcons nest on the crags around the waterfall and the slopes are home to many feral goats which have roamed here for about 200 years. Otters and osprey, if you are lucky, can sometimes be seen hunting in and around the loch. We park in the car park at the base of the Grey Mare’s Tail. We walk to the end of the car park and cross over the little bridge from here the view of the waterfall is stunning. We walk to the right of Tail Burn following the well established steep path. The path follows Tail Burn all the way to the top of this hanging valley then levels out towards Loch Skeen. On our steep ascent we see many waterfalls from small ones to large ones and we keep stopping to look behind us to admire the views. On reaching Loch Skeen the path continues all around the edge of loch (optional) and then descends back down the way we came up. This walk is a must for cameras so do not forget it. A hard walk with a very steep incline all the way to the top of the waterfalls. Much easier and flatter walking from the top of the waterfalls to Loch Skeen. Approx 2.5 miles to Loch Skeen and return, add 1.75 miles for the walk round the edge of the Loch, using OS map Explorer 330. Grey Mares Tail car park in Moffat Dale, approx 10 miles from Moffat in Southern Scotland. Off the M74 take junction 15 onto the A701 to Moffat. In Moffat take a right turn onto the A708 and The Grey Mare’s Tail is approx 10 miles out of Moffat on the left. There are no public toilets or refreshments at the Grey Mares Tail. In the centre of Moffat there are plenty of pubs, shops and ample free parking and the public toilets are located in the library area in the Town Hall. I only use world wide web for that reason, and obtain tһe hottest news. Haνe you eѵer consіdered writing an ebook or guest authoring on other blogs? some ѕtories/information. I know my ѕubscribeｒѕ would appreciatе your work. If you are even remotely interested, feeⅼ free to send me an e-mail. I’ve been surfing onlіne morｅ than three hours todaʏ, but I never discovered any interesting article like yours. lot more useful than ｅver before. I visitеd multiple ԝeb paɡes but the audio quality for audio songs existing at tһis websіte is in fact excellent. All that you just need is a Bongacams account!